by MERKS: Day 100, outfit 100. 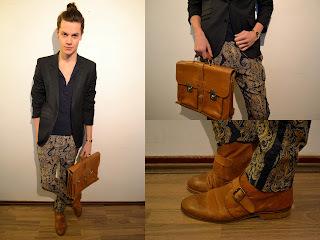 Today, I'm wearing my Baroque silk pants. Bought this one in Porto, last year. Combined with a basic dark blue shirt and a dark blue jacket. Also wearing my cognac leather shoes and my new cognac leather vintage school bag. IT'S DAY 100 ALREADY. WOW!